A revamp on an old newspaper headliner originally from the 1970s, The Post is an Oscar-nominated film starring Meryl Streep and Tom Hanks. 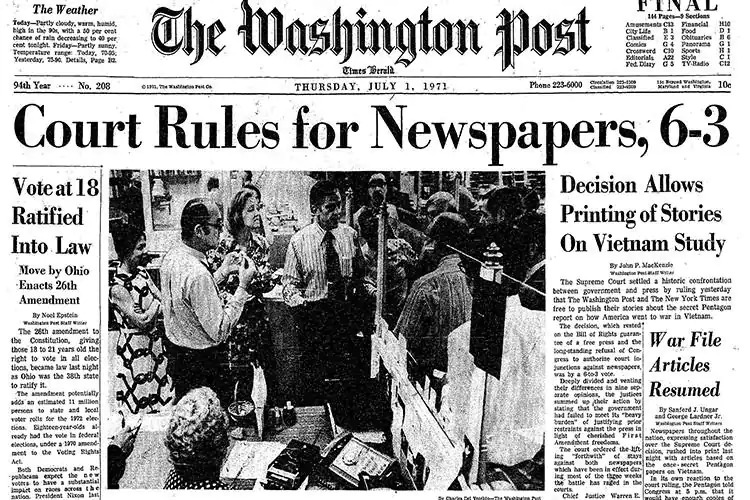 A Steven Spielberg biopic, this story, featuring The Washington Post, is about the country’s first female newspaper publisher who printed the Pentagon Papers. On the opening weekend at the box office, the movie made nearly $20 million just in the United States. Worldwide to date, the movie has made over $60 million due to the huge critical response. The film was nominated for two Oscars along with nearly 80 other nominations in many other award ceremonies. Streep received yet another Oscar nomination for her role as Kay Graham, the publisher of The Washington Post. In this role, she faces the hard decision of whether or not to publish classified documents concerning the Vietnam War. Hanks was nominated for Best Actor in a Motion Picture for the Oscars as well. His performance as Ben Bradlee, the editor of The Washington Post, was that of a progressive editor wanting the biggest and best story. This movie being set in the 1970s showed many of the issues America faced during that time frame. Streep’s character being the first ever female newspaper publisher faced the trials of breaking into a “man’s world.” She showed grace, in the beginning, letting men tell her what is best. As the movie progresses, she realizes that The Washington Post is her paper and no one else’s. Cambree Michelson says she gives it a 10 out of 10 and would definitely go see it again. Drew Rice says, “Although I knew what was going to happen, the movie presented a sense of doubt.” This perspective of doubt allowed the viewer to fully feel what it was like to make the huge decision of sharing the United State’s secrets. Overall, this is a very well made movie. I enjoy movies with historical relevance, and this moment of time is incredibly important. As this event is lesser known in history, it was a good movie to see and well-timed for when it came out. This movie is one my favorite movies I have seen in the theater in the last 6 months. Wonderfully cast, including background roles, everyone in the movie really made the viewer feel as if they were in a newsroom in the 1970s. This movie is not only a history lesson, but a fun movie to experience in theaters. Caleb Rose, Staff Writer, was born and raised in Amarillo, Texas. Caleb has recently returned to Southern Nazarene University and is a Sophomore Mass Communications major. Caleb’s passions include music, theater and spending time with friends.